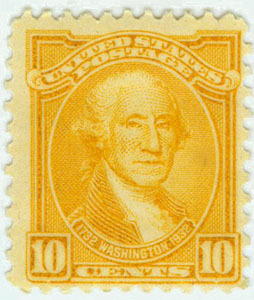 In cooperation with the National Celebration of the Two Hundredth Anniversary of the birth of George Washington, the United States Post Office Department authorized a special series of 12 postage stamps in denominations of ½ cent to 10 cents, inclusive, to be kept on sale throughout the anniversary period in lieu of the regular series of stamps. 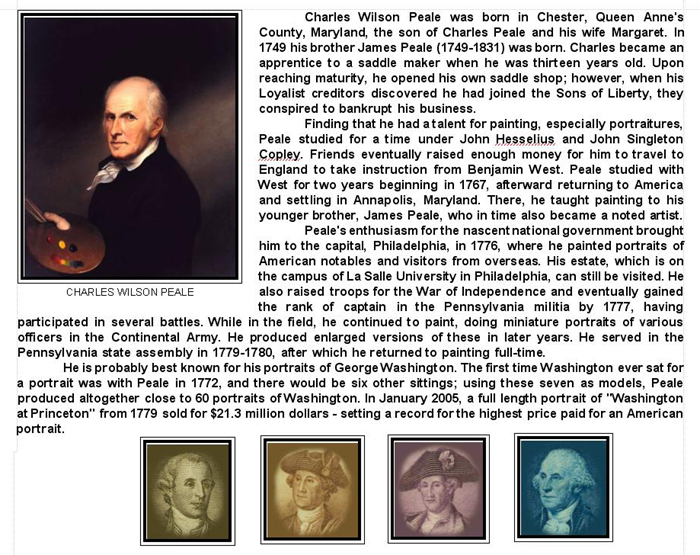 The year 1932 marked the 200th anniversary of the birth of George Washington. A wide variety of events celebrating this bicentennial was planned throughout the nation and the Post Office planned a series of stamps to commemorate the anniversary as well. Early ideas had the series being a set of bi-colored large frame pictorial stamps including among other things, Washington's home at Mt. Vernon, the crossing of the Delaware, Washington at Valley Forge, George and Martha Washington, Washington on horseback, the U.S. Capitol, Washington's tomb, the Wakefield, Virginia homestead where Washington was born, the inauguration of Washington, Washington resigning his commission and the Washington monument. This may have led to a very attractive set of commemorative stamps had the concept of using various portraits of Washington not won out. 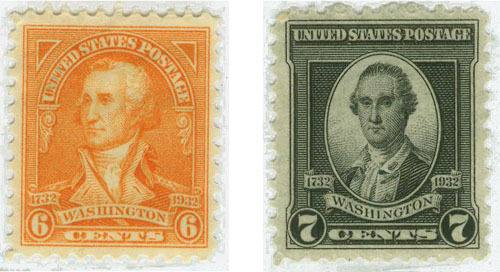 In another early proposal, the Postmaster suggested an issue of as many as eighteen stamps through the $5 value, most likely to replace the Series of 1922 designs. 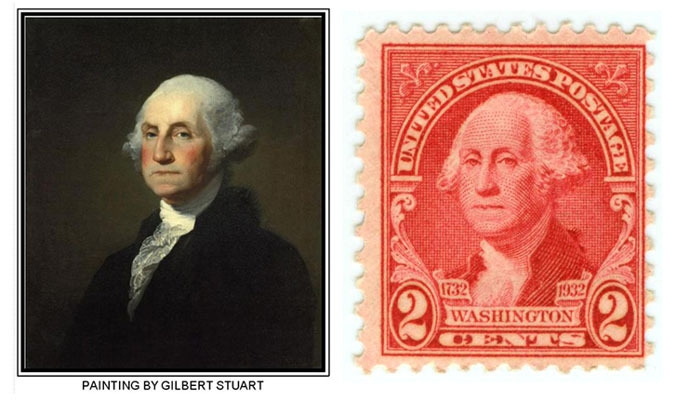 Congress even got into the act with a bill proposing that all postage stamps issued in the United States and its possessions for the entire year of 1932 would bear the portrait of Washington. The bill never passed. 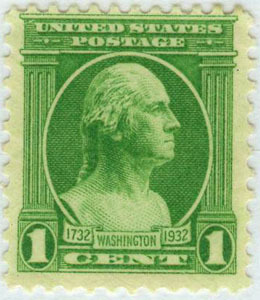 Ultimately the stamps were issued in single colors in the same size as the regular issues, most certainly as a cost-cutting measure, after all 1932 was in the heart of the Great Depression. 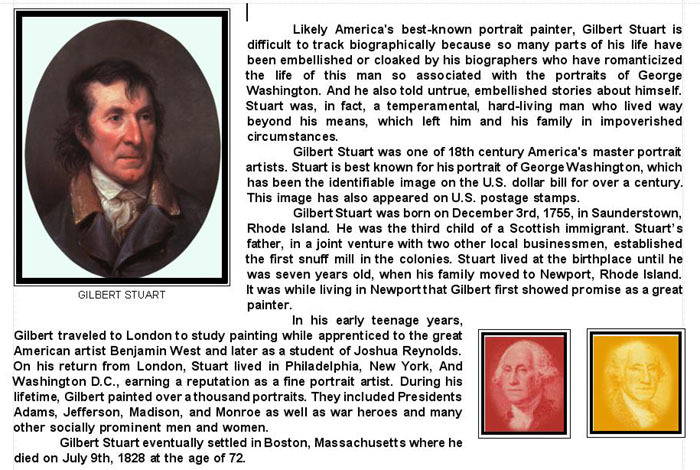 It was no accident that the two cent stamp bears the popular Gilbert Stuart portrait, the same portrait, although reversed, as the one that appears on the one dollar bill. The two cent was the most common stamp, being the rate for the first class letter. George Washington ( February 22, 1732 – December 14, 1799 ) served as the first President of the United States of America ( 1789–1797), and led the Continental Army to victory over the Kingdom of Great Britain in the American Revolutionary War (1775–1783 ). Dissatisfied with the Articles of Confederation, he presided over the Philadelphia Convention that drafted the United States Constitution in 1787. 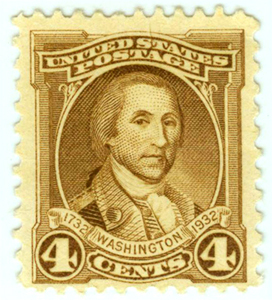 Washington became President of the United States in 1789 and established many of the customs and usages of the new government's executive department. He sought to create a great nation capable of surviving in a world torn asunder by war between Britain and France. 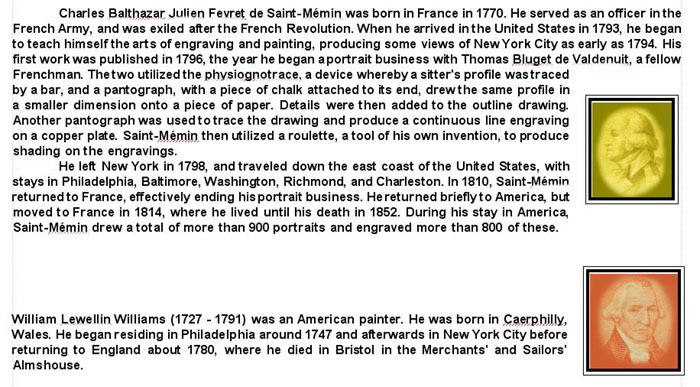 His unilateral Proclamation of Neutrality of 1793 provided a basis for avoiding any involvement in foreign conflicts. He supported plans to build a strong central government by funding the national debt, implementing an effective tax system, and creating a national bank. Washington avoided the temptation of war and began a decade of peace with Britain via the Jay Treaty in 1795; he used his prestige to get it ratified over intense opposition from the Jeffersonians. Although never officially joining the Federalist Party, he supported its programs and was its inspirational leader. Washington's farewell address was a primer on republican virtue and a stern warning against partisanship, sectionalism, and involvement in foreign wars. Washington is seen as a symbol of the United States and republicanism in practice. 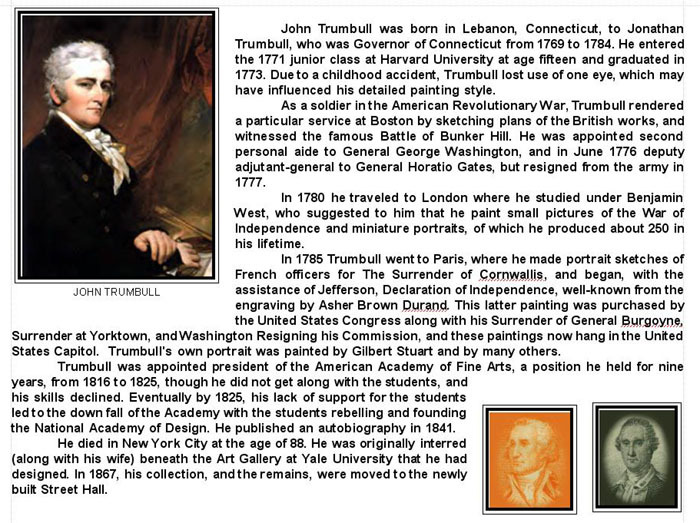 His devotion to civic virtue made him an exemplary figure among early American politicians. Washington died in 1799, and in his funeral oration, Henry Lee said that of all Americans, he was "first in war, first in peace, and first in the hearts of his countrymen." Washington has been consistently ranked by scholars as one of the greatest U.S. Presidents.